With fall just days away, we can’t help but think (admittedly too much) about transitional dressing. It’s always a bit tricky, but one of the easiest ways to master in-between-seasons style is an oldie but a goodie: a Kate Moss–approved army jacket. Here’s why: Firstly, the breathable yet substantial material serves to somehow keep you warm without ever making you feel too hot. Also, the color of an army jacket (whether it be an olive green, khaki, or even camo) acts as a neutral, meaning you can pair it with anything and it will blend seamlessly with your outfit. Lastly, they can be easily dressed up or down, as demonstrated by comparing these Olivia Palermo and Emma Roberts looks. Now, you’re probably thinking But I already own an army jacket, to which I urge you in response to take a look at it and assess whether it feels stylish, clean, and worthy of wearing in 2016 (since most of us bought them more years ago than we’d like to admit). If so, then you’re done! Wear it at your leisure. If not, we’ve got you covered with the best ones to buy now. 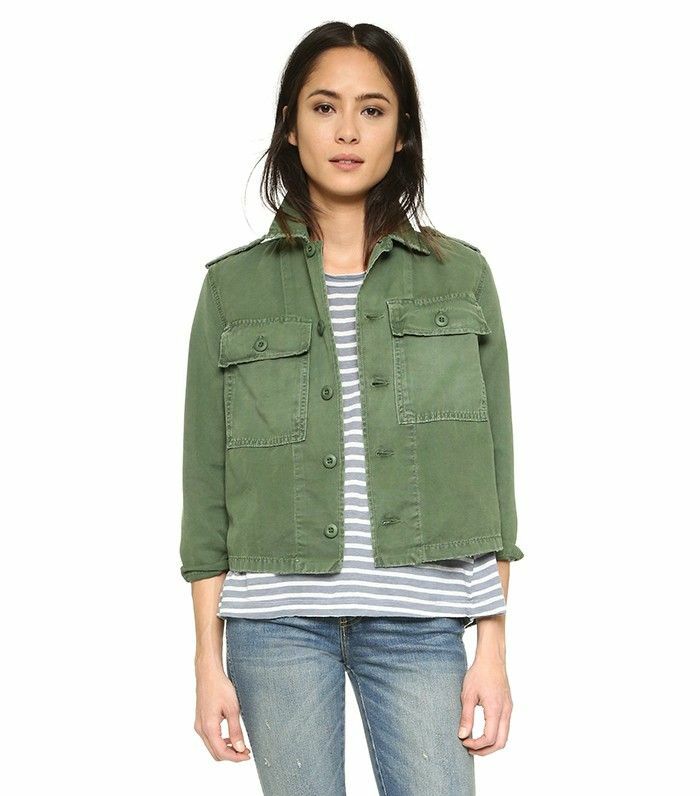 Shop our army-jacket picks below! Cropped jackets are perfect for pairing with high-waisted skirts and pants. Structured shoulders give this a more polished feel. Raw hems make everything feel more current. This camo jacket will look so cool with an otherwise-dressy outfit. We love the lived-in feel of this one. Call us biased, but this affordable jacket only seems too good to be true. See how Emma Roberts makes this Forever 21 jacket look like designer. If you want more of a statement piece, this one also comes with a print on the back. This version from The Great is so good that it's constantly selling out. This brand is all about reinventing classic pieces like this army jacket. Kate's may be sold out, but this Topshop version isn't too shabby either. Patches are an easy way to update anything. Only Saint Laurent can make an army jacket look so luxe. We love how H&M styled this with a crisp white shirt. We're taking notes! In the mood for some outfit inspiration? See the latest street style from NYFW here.